TV show dates: July 28, 2017 — September 11, 2017. Performers include: Matt Bomer, Kelsey Grammer, Lily Collins, Rosemarie DeWitt, Dominique McElligott, Enzo Cilenti, Mark O’Brien, Jessica De Gouw, Koen De Bouw, Jennifer Beals, Saul Rubinek, and Eion Bailey. 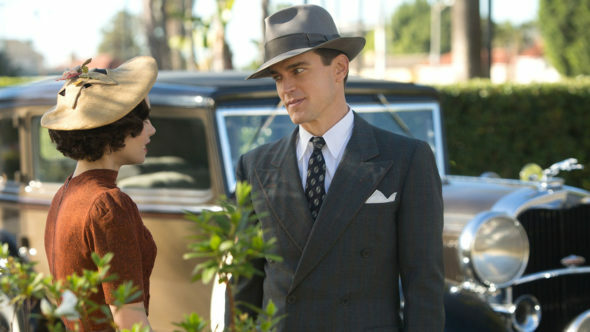 A drama, The Last Tycoon TV show centers on “Hollywood’s Golden Boy” Monroe Stahr (Bomer). The young impressario struggles with studio boss Pat Brady (Kelsey Grammer), over the path the studio should take. When the Nazi regime informs the studio that they will have to abide by Hitler’s standards, if they want to release their films in Germany, Stahr refuses to go along. Brady allows them to nix Stahr’s new film project — a love letter to his late wife. Set during the Great Depression — as Hitler’s influence grows in Europe — The Last Tycoon chronicles the high and lows of the film industry, in 1930s Hollywood. The Last Tycoon is a TV show adaptation of F. Scott Fitzgerald’s unfinished novel of the same name, inspired by the life of legendary film producer Irving Thalberg. While still in his 20s, Thalberg — “The Boy Wonder” — became head of production at Metro-Goldwyn-Mayer (MGM). He would remain there until his death in 1936, at the age of 37. Thalberg played a crucial role in the careers of many movie stars of the day, including his wife Norma Shearer, as well as stars like Clark Gable, Joan Crawford, Greta Garbo, and Lon Chaney. Studio head Louis B. Mayer thought highly of Thalberg. The two worked well together, at least until they clashed over the types of films they wanted to make. What do you think? Did you enjoy The Last Tycoon TV series? Should it have been cancelled or renewed for a second season on Amazon? Tell me it’s not cancelled!